The Shintô Musô Ryû was founded nearly 400 years ago in about 1605. The founder, Musô Gonnosuke Katsukichi was a warrior who first trained in the Tenshin Shôden Katori Shintô Ryû founded by Iizasa Choisai Ienao. In this, Musô Gonnosuke received the rank of Menkyo, a teaching license. According to legend, Musô Gonnosuke had gone to Edo early in the Keichô period (1596-1614). There he matched his sword against many famous swordsmen but was never defeated. One day, however, he fought Miyamoto Musashi, perhaps the best known warrior in Japanese History. Gonnosuke knew he had met his match when he found he could not escape from Musashi’s Jujidome technique. This movement was the secret of Musashi’s Niten Ichi Ryû and involves locking the opponent’s weapon in an X-shaped block using the Samurai’s long and short swords in combination. Because of his defeat, Gonnosuke travelled around the country and studied many different styles of martial arts, determined to become strong enough to overcome Musashi’s Jujidome. After several years, he arrived in the province of Chikuzen and stopped at a town which is now called Dazaifu City, in Fukuoka Prefecture, on the Island of Kyûshû. There he confined himself for 37 days in the Kamado Shrine on Mount Hôman. One night he had a dream in which a divine messenger appeared in the form of a child and told him to “know the solar plexus with a round stick”. Keeping this heaven-sent message in mind, Gonnosuke devised a new weapon. It was a simple stick approximately 30 cm longer than the average Japanese sword. Musô’s stick was 128 cm long (4 Shaku, 2 Sun, 1 Bu) and 26 mm in diameter (8 Bu). Today, we call it the Jô (or Tsue). Gonnosuke went on to develop techniques for his stick based on his previous experience with a variety of older weapons. 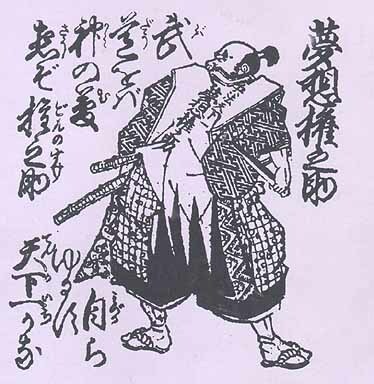 He incorporated the thrusting movements of the spear (Yari or Sôjutsu), the sweeping movements of the halberd (Naginata or Naginatajutsu), and the striking movements of the staff (Bô or Bôjutsu) and the sword (Tachi or Kenjutsu). With this new weapon and its techniques, the art of Jôjutsu was born. The legend says that Gonnosuke went back to confront Musashi again and emerged victorious, overcoming Jujidome and inflicting the only defeat ever said to have been suffered by the legendary Musashi. Musô Gonnosuke’s growing reputation brought him to the attention of the Kuroda Clan in Fukuoka, and he was retained to instruct Jôjutsu to the warriors under its control. Over the course of his life, Gonnosuke eventually awarded teaching licenses to more than ten of these warriors. They and their successors carried on the tradition within the land of the Kuroda family, who jealously guarded the art as a secret Clan tradition. By the end of the Tokugawa period (1603-1868), it is said that there were two dôjô in the Kuroda area. One was run by the Hirano family, under the 15th Headmaster; the other was operated by the Hamachi family, under a man usually regarded as the 18th Headmaster. After the Meiji Restoration, permission was given to teach Jôjutsu outside the domain of the Clan in 1872. By the early 1900s, Uchida Ryôgorô was teaching this art in Tôkyô. Among his students were Uchida Ryôhei, (his second son), Nakayama Hakudô (famous kendô and iaidô Master and an admiral of the Japanese Imperial Navy) and a Kabuki actor named Morita Kanya. Back at the headquarters in Fukuoka, Shiraishi Hanjirô Shigeaki, called the 24th generation Headmaster of the art, continued to teach jôjutsu until his death on March 1, 1927. After that, jôjutsu was taught by his high-ranking students: Takayama Kiroku, Shimizu Takaji, and Otofuji Ichizô. Shimizu came to Tôkyô in 1927 and began to teach jôjutsu under the sponsorship of two influential men, Toyama Mitsuru and Suenaga Setsu. He made the Toyama Dôjô his base and travelled widely, teaching such groups as the Metropolitan Police Department, the Kobudô Research Group run at the Kôdôkan Jûdô Headquarters under the encouragement of Kanô Jigorô, and other groups in various local areas nationwide, including Sea Scouts. He also instructed in Manchuria after the area came under Japanese control in the early 1930s. Some time after the death of his Teacher Shiraishi, Shimizu became head of the Dai Nihon Jôdôkai which officially altered the Ryûmei (name of the Tradition) from Jôjutsu to Jôdô in 1940. When defeat in the Second World War brought a ban on all martial activities, jôdô followed the route of other arts, disappearing for a time, to be gradually revived later. Public demonstrations began again around 1955. The All Japan Jôdô Federation was established in 1955 by Toyama Izumi. By this time, Shimizu seems to have been recognized as the 25th Headmaster of the Ryû. In the 1960s, jôdô was recognized by the All Japan Kendô Federation which set up an expert committee mainly composed of Shimizu Sensei and Otofuji Sensei. The goal was to devise ways of spreading jôdô around Japan. Specifically, the giant organization was looking for a form of stick art suitable as a cognate study of kendô trainees. Finally, in 1968, the All Japan Kendô Federation section of jôdô introduced their “Seiteigata” forms. The twelve kata in the kendô system of stick are taken from the first three levels of the Shintô Musô Ryû and are considered to be representative of the techniques of this tradition. Small, yet significant changes were made, the most outstanding one being a much more frontal position. 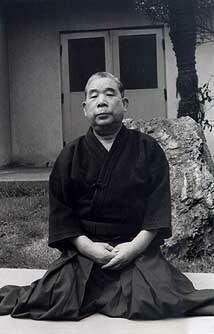 Shimizu Sensei died in 1978 without naming a successor. Many of his students around the Tôkyô district carried on the art as he had taught them. Kaminoda Sensei continued to teach in a dôjô very close to Shimizu Sensei's house, in the Shibuya area, as well as at the Dai-Yon Kidôtai in Yotsuya. Yoneno Sensei and Hiroi Sensei continued to give impressive demonstrations together, Kuroda Sensei passed away in January 2000, Otofuji Sensei passed away in 1999. Nishioka Sensei created a group of some 15 to 20 students in Hinô, at the Mitsuyama Dôjô, then another one near Kamakura, and two others in the center of Tokyo and near his house in Fuchu-Shi. Meanwhile, in Kyûshû, other senior students are also teaching. Nishioka Sensei created a group named Seiryukai. The EJF then created a group called Seiryukai Europe. This group gathers the seniors European students of SMR having obtained classical certificates (Oku iri, Sho/Gomokuroku, and Menkyo kaiden) and is considered as the European branch of Seiryukai. Currently (2013) most of these masters do not participate physically in the training sessions any more, due to their old age. But they are still heading their groups and keep contact with their students in charge of continuing their mission. Considering that the History of Shintô Musô Ryû Jô would become actuality if recent developments were examined here, we shall close this chapter now, but not without reminding all the readers that it is thanks to the extraordinary open-mindedness of Shimizu Sensei and the impressive investment of Donn F. Draeger Sensei, as well as the wonderful investment of Nishioka Sensei, that Jôdô and its extremely rich system of education is nowadays available to us all. Shimizu Sensei ( right ) and Kuroda Sensei performing Embu in the early 1960s.